Rival regional carriers First Air and Canadian North spent months negotiating a merger in 2014 before talks fell through. Canada’s eastern Arctic is too big and remote to support two regional airlines, says Charlie Watt, president of Nunavik’s Inuit corporation Makivik. That’s prompted another round of merger talks between his organization’s First Air and its rival, Canadian North, which is owned by the Inuvialuit Corporate Group. And Watt says he hopes Nunavut’s land claim organizations end up buying a piece of the new airline. Such an investment may help make airfares in the region more affordable, he said in an interview with Nunatsiaq News. “If the companies are owned by everyone, I think that’s the only positive thing to do,” he said. First Air and Canadian North announced on July 7 they had struck an agreement in principle to merge. Makivik started the talks under the new direction of Watt, following his election as president of the Nunavik land-claim organization earlier this year. But Watt, who has a long history with Makivik, and served as one of its founding presidents before moving on to become Nunavik’s senator, says the idea of Canada’s Inuit organizations collaborating to operate an airline is an old one. If the current merger proposal comes to fruition, the new airline would operate under Canadian North’s name, while using First Air’s livery — including the Inuksuk logo emblazoned on the tails of its planes. The new airline would be headquartered in Ottawa. Merger talks are hoped to be complete by the end of 2018. In 2014, Makivik and the company that then owned Canadian North, Norterra, spent seven months negotiating a merger of the two airlines, but were ultimately unable to reach a deal. The new merger plans still must be finalized and approved by regulators. One big question mark, for now, remains over whether Nunavut’s Inuit organizations will get on board, said Watt. 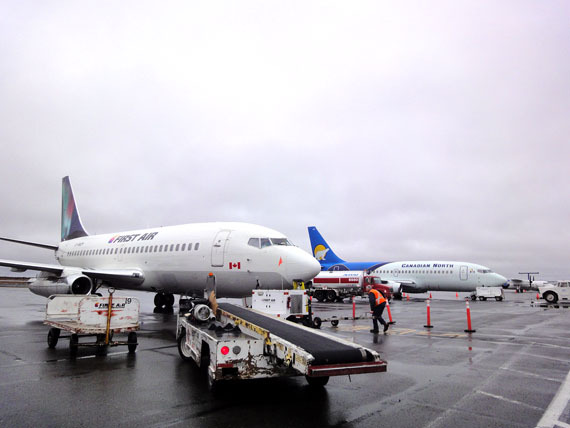 Nunavut’s air travellers, meanwhile, may wonder if the proposed merger, and subsequent loss of competition, will result in less frequent flights and pricier airfares. Watt said it’s too early to discuss details, but he said there’s money to be saved if both airlines stopped competing on small, money-losing routes and instead pooled their resources. “You’ll probably improve the regularity of flights into the community,” he said. “And we don’t have any intention to raise the airfare. What we’re trying to do is that, down the road, when it becomes more economical, we can reduce the airfare. Now, as you know, it’s very high. And we need to do something about that.